On March 27th, 2017, the first New Moon of the astrological new year will occur in the sign of Aries! In addition to the Sun and Moon, Venus retrograde, Mercury and Uranus will also be in Aries at this time. With such an immersion of cardinal fire some new excitement is bound to erupt! New Moons happen when the Sun and the Moon conjoin, blending their energies into a unified force. The power of rebirth and regeneration is enhanced at every New Moon, but this one in Aries will be particularly impactful because it comes with a special rush and push of inspired growth! In the sign of Aries, the Sun is exalted and the Moon is unusually independent. Thus, this New Moon will be a moment where you will be filled with the courage to live in pursuit of your most burning desire. For more insight into what area of your life might become most inflamed by this lunation cycle, examine the area of your chart where Aries falls. If you would like a personal reading about how you might best harness the power of this New Moon for positive growth, you can book an appointment with me here. A tremendous rush of Arian influence will be summoned by this New Moon since both luminaries will be in a conjunction to Venus retrograde, now in the midst of her transition from evening to morning star. Thus, passion may be very quick to develop and just as quick to fade. Normally a conjunction between a New Moon and Venus would herald many sweet blessings of love and luxury. But her retrograde motion in her sign of detriment indicates a sudden blaze of fierce independence, burning away vulnerability and glazing many lovers’ eyes with an imperious gleam. This New Moon in Aries does not represent any refined arts of seduction but is more akin to a great blast of dynamite, using destructive force to uncover many hidden rivers of precious ore. When a fired up ego battles another for supremacy, damage is definitely done. However, the heated temperament of the New Moon in Aries conjunct Venus retrograde is not necessarily negative. Many forms of love and art will flourish under this potent surge of passion. To attack a guitar might create some of the greatest rock n’ roll ever recorded. And to attack one’s lover in the same way might reignite long lost intimacy. A little wild abandon can easily invite the splendor of Dionysian ecstasy. Venus retrograde in Aries is also in a mutual reception with Mars in Taurus. Because both of these planets are in their signs of detriment, it is very likely that no matter what happens at this New Moon, you will feel that a measure of elegance and finesse are lacking. No matter. Mars’ sextile with Neptune in Pisces will imbue you with extra intuition, helping you to appreciate the true nature of even the roughest types of people. You may find poetry in the most unlikely places. This of course is made all the more possible by the lingering conjunction between Mercury and Uranus in the third decan of Aries, which will make this a time for truly original thinking and mind-blowing encounters with genius. 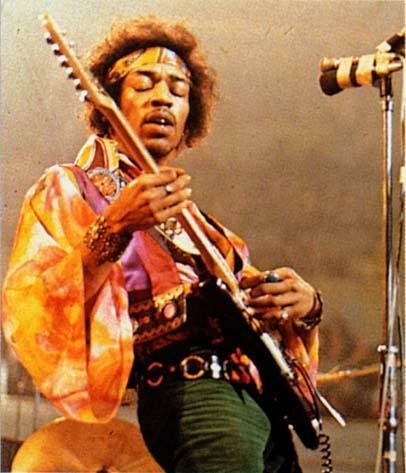 For an inspiring retrospective of genius, let’s look again at Jimi Hendrix, who was a 20th century bard: both a talented poet and musician. For those who love poetry, 1960’s rock n’ roll occupies a special place because it was a great revival of Romantic ideals that was also making great innovations to lyrical form. The influence of Uranus in action can really be felt in the spirit of the 60’s, becoming especially powerful when Uranus and Pluto were conjunct in Virgo from 1963-1968. Even more memorable is the manner in which he played guitar, which has earned him the accolades of “greatest guitarist in rock n’ roll” by many. 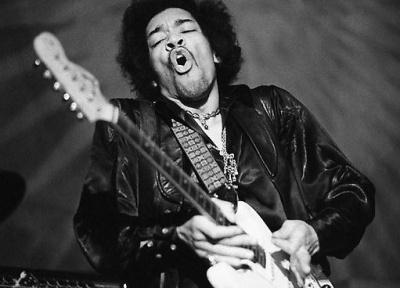 Not only did he have a great gift of musicianship, Jimi Hendrix also played the guitar anyway he wanted to. He would perform on stage with his guitar held upside down, behind his back and in his teeth. Most famous of all of course was when he lit his guitar on fire! To add to the already vibrant energies of this New Moon in Aries, Jupiter in the opposing sign of Libra will be in a tense square to Pluto in Capricorn, amplifying your ability to reach a new pinnacle of success. Whatever it is that you burn with desire for could easily be within your reach at this time. However, be forewarned that Jupiter square Pluto could easily lead you down the road of excess, leading you to impale yourself upon your pride. So at this New Moon, when you feel inspired to take action, be sure to fully exhale any excess mania before proceeding. Philosophically speaking, Jupiter square Pluto has the potential to suddenly reveal a new layer of mystery. Considering the erratic energies of Mercury conjunct Uranus in Aries, this illumination will probably be unexpected. Thus, this is a time to submit to the shimmering web of synchronicity, where symbols and signs forever weave in and out of one another. No matter how strange it may be, carefully observe the messages that you receive. You will gain valuable insight about what questions you should really be asking about life. During this New Moon period, adventure will seek you out. Let the natural enthusiasm of Aries spark a new momentum within you, creating an array of experiences that shine with novelty! This New Moon in Aries will be illuminated by a raw and uncut brilliance: an unpolished gemstone of your potential for genius. Accept the gifts you receive without criticism and there will be great rewards. In the fiery blazes of Aries, set the intention to fearlessly forge ahead to meet your destiny!